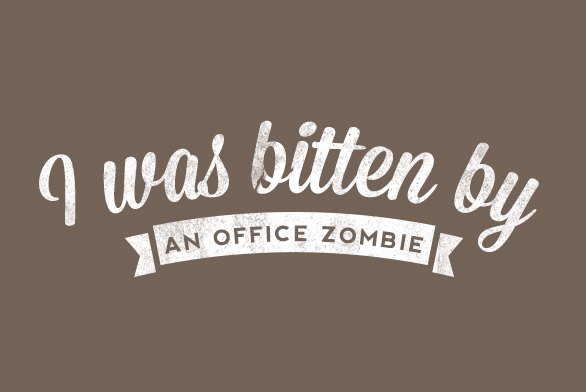 Like most workplaces, I found myself surrounded by a large number of … well zombies. That’s what I’ll call them. 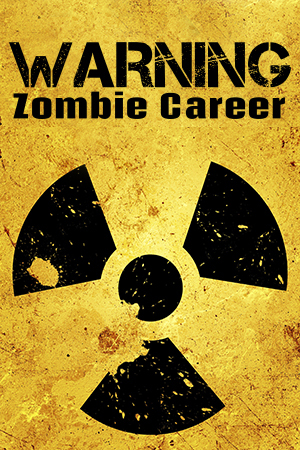 Zombie careerism runs rampant around us. Get a pay check. Work hard. Get a promotion. Rinse and repeat. 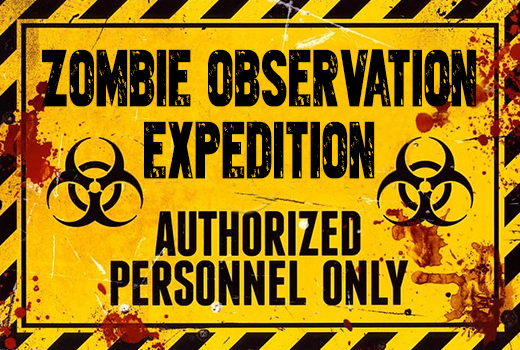 My personal zombie observation expedition started with my first interaction, on my first day, at my first grown-up job. I stood outside, looking at the bland, tan bricks of the government building I’d call my work home. Something felt off. My senses caught an eerie presence. With a deep breath, I brushed away the thought and entered. My purgatory was about to begin. Rosie greeted me from behind a gray desk in a gray room with a gray sign-in binder. I think I first noticed it when she smiled at me. She had that I-hate-my-job look. You know, when someone smiles with their mouth but not their eyes? Her skin was pale. Frighteningly pale. With a tint of green. Definitely zombie-ish. “Oh, so you’re Joey. I heard you’d be coming in today.” Joey… What am I, a baby kangaroo? Here’s hoping that name won’t stick. “Yes, I am. I go by Joseph.” I forced out a cordial smile. “Give me your badge number and paperwork so I can get you access to the building.” Why was the building locked? Must be to keep employees from escaping. “Oh… I think it’s 412745.” Prisoner number 412745 reporting in. “Right this way.” A low beep sounded as the locked door clicked open, and she nodded for me to enter. Inside, she led me straight back through row after row after row of 5′ x 4′ gray cubicles. A light flickering at the end of a hallway caught my attention. I turned to move on, but out of my peripheral vision I saw something. I glanced back to get a better look, but it was gone. Rosie was walking away, so I continued after her in a brisk trot. I passed a few more zombie habitats, where I caught my first glimpses of a few amiable zombies who I’d become friends with in the future. As I would learn later, one wished he could be designing circuit boards and building robots. Instead he was writing technical manuals for the government (death-by-boredom). Another wanted to flip homes and work for himself, but had given up on his aspirations as a pipe dream. A third wished he could launch a business one day, but hadn’t taken any steps toward that distant far-off dream land. Rosie opened the door to a large office and a floor-to-ceiling window — the only natural lighting on the whole floor. My working theory is that the zombie virus breeds more rapidly in confined spaces, with an absence of fresh air and natural sunlight. I stood waiting for a moment and heard the warden and the guard talking about their new recruit Joey in hushed whispers. My mind wandered and again I felt the eerie presence. A feeling like I was being hunted. I looked back at the office door, still waiting. Suddenly, two hands grabbed me from behind, and a shard of pain stabbed my shoulder. I flung myself around, but saw nothing. I felt my shoulder with my hand… no wound. Was it my imagination? What was going on? I walked into the room feeling disturbed. My new boss gestured for me to sit across from her, all the while her gaze never leaving her computer screen. The small plastic ficus tree next to my chair poked at me annoyingly as I settled in. Mrs. Bosslady continued typing at her computer, then glanced over at me briefly. “Did your in-processing go okay?” So much for small talk. And finally, the moment I had been waiting for, she led me to my desk. It was down the hall, 1 left, 1 right, 1 left, 1 right, 1 left and 1 final left bringing me to a hidden room, three locked doors from sunlight. My cell mates, a half-deaf, almost retired project manager and an engineer a few screws short of a robot didn’t even look up. 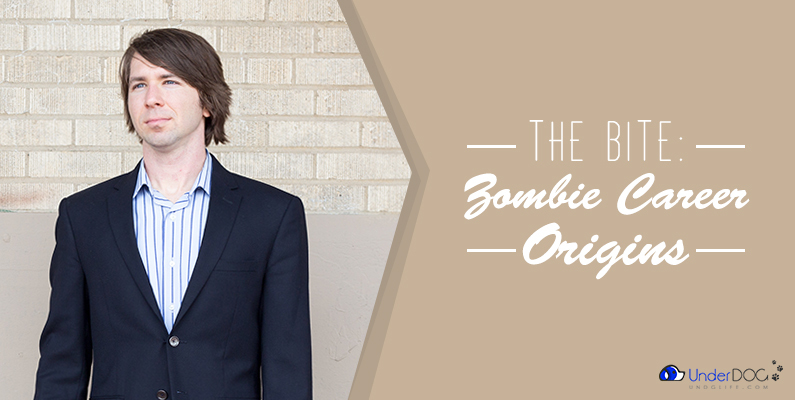 I strongly believed both to be infected with a particularly dangerous strand of zombie careerism. There I sat in my 5′ x 4′ gray cell beneath fluorescent lights and surrounded by silence. My shoulder throbbed with pain. I took a closer look. There it was. A pale green patch of skin. That same pale green I had seen on Rosie. In that gray corner, in a nondescript government building, surrounded by faded dreams and chipped paint, I made a solemn oath. This would not be a life sentence. I would not stop short of God’s destiny for me. This prison yard of fluorescent lights would be my training ground, and I would find a cure to this zombie infection. The first month was the worst. The green patch from my mysterious bite had spread, and I hadn’t gotten any closer to finding a cure. Work was demotivating, but I distracted myself with learning the rules and regulations of cubicle prison. One cold morning in November, I came into the office and sat down at my desk. I soon found myself deep in thought. I leaned back in my chair, and closed my eyes. When I opened my eyes, I saw a man who looked like me. Exactly like me. A clone? Except he was dressed in a cardigan, with thin, circular glasses perched on his nose, and a long pointing stick in his hand. “Hi, I’m Professor Joseph,” the imposter said confidently. “So, you’re me?” I stammered. Great. I’m insane. I guess this is what a psychotic break feels like. “Umm… What should I call you?” It wouldn’t do having two Josephs in my head. He shrugged. “Call me whatever you want. I’m part of your subconscious.” Well I guess he is me. He should like any name I choose. “I’ll call you Prof.” I decide hesitantly. “Prof? You didn’t sprain any muscles thinking up that one.” Prof started writing on the white board as we talked. “So why are you here, Prof?” I continued, unabated by his sarcasm. “I’m here to analyze and theorize based on your observations. You’re the face, and I’m the brains,” Prof said this without looking back at me. I glanced around, and I wasn’t in my office anymore. I was in a room that resembled a college classroom. “I think I do pretty well on my own…”. Prof stopped. Put down his marker. Then stared at me for a long second. “Doubt it.” He turned back to what he was doing. “How should I put this. You’re more of the street smarts type.” Before I could form a retort he continued. “Moving on! What would you like to learn about today?” Prof posed the question to me. “Umm. Well… I was bitten by something about a month back, and it looks like it’s infected. The skin is turning greenish. Do you know how to treat the infection?” In response to my question Prof’s marker began excitedly squeaking on the board. Prof alternated between writing on two white boards. I couldn’t make out what he was scribbling on one of them, but he had drawn out a diagram labeled “Career Path” on the other one. Finally, he looked back at me, and gestured to the drawing. “Yes, that seems true enough, but how do their high hopes for my career translate into killing my dreams and passion?” My shoulder itched where I had been bitten. I scratched at the patch of infected skin. “They’ve learned from other employees and top rated management books that good executives train their employees and provide them the ability to improve themselves. With the best of intentions, they develop career paths, certification requirements to differentiate candidates, and systems for rating their performance. “These requirements and ratings work their way into the incentives felt and communicated by mentors, bosses, and other employees in an organization. As you climb higher in the ranks more people compete for fewer spots. The increased competition forces the best candidates to choose between living life or succeeding at work. To try to differentiate themselves the best employees must work longer hours, gather better certificates, degrees… and sacrifice more. 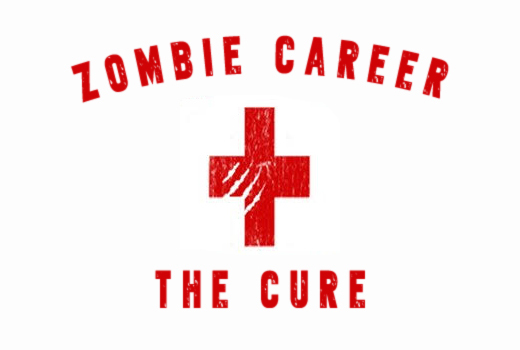 “Eventually, these incentives and social norms are codified into a set of behaviors we describe as Zombie Careerism. The actions don’t originate from an employee’s internal motivations: his search for meaning, his freedom, his passion, or his interest.” Prof wrapped up his explanation of the diagram and erased it from the board. He went back and scribbled a few more lines on the second board, but the writing looked fuzzy, and I couldn’t make out what it said. “Okay, but why don’t other people hate it as much as I do?” Among the zombie hordes, I had actually found uninfected people who seemed oblivious to the infection. I’ve always found this puzzling. “A lot of people hate it. “However, people’s personalities and levels of courage determine how they experience cubicle prison. Since most people adapt to the society around them and many fear the unknown, they’re more likely to change themselves rather than change their surroundings. “People conform to the norm. Some even thrive in cubicle prison. Outside these walls there’s a jungle where you only eat what you kill, and predators abound.” Prof paused and stared intensely at me for a few seconds then looked back to his white board. “There’s a personality trait called disagreeableness that entrepreneurs rate high in. That means they don’t conform to management structures. It’s in your personality. Your psyche resists the infection more than others. That’s why it’s spreading so slowly. It also makes you quite miserable while working for other people.” Prof started to pack up his materials. “Are you finished? A slowly spreading infection doesn’t mean I’m cured. How do we fix this?” I scratched again at the patch of green skin. “That, I can’t tell you. Not yet at least. After all, I’m you and I only know what you know.” The dreamscape faded away, and I was back in my office. I had to find a cure. Now it’s your turn. Drop a comment in the box below and tell us about a soul-sucking job you’ve had in your life, and how you overcame it.